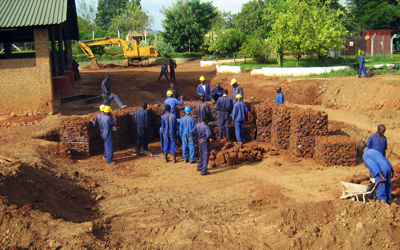 Through its extensive experience in diverse regions around the world, Gulf is aware that mining companies are often the dominant development agent in the area of their operations, frequently providing physical infrastructure such as roads, electricity and telecommunications, and services such as housing, water, health care, education and food to the communities in which they source their labour. This can create significant problems for both companies and the affected communities arising out of over-dependence on a single mode of development. When we leave, it is our aim to leave behind a more self-reliant community through our investment in people and the support of sustainable projects. As such, Gulf’s policy on socio-environmental issues is that of Partnership – a partnership between Gulf, the community of which Gulf becomes a part and the host government. Our Partnership Policy builds on the idea that each sector in society has core competencies and resources that, if appropriately arranged, are complementary to one another. Skills Transfer: whenever possible, we endeavour to employ local people for our operations and if appropriate we establish training programmes in place to enable increased local employment and skills transfer. Capacity Building: a more hands-on approach to the implementation in order to assist in the building of community and government capacity. Dialogue: agreement between parties to consult with each other during the preparation of regional plans and policy, environmental and social reports, etc. Shared work plan: between the parties for each to implement an independent set of tasks that, together with the tasks of others, build towards a common goal. Shared responsibility: an arrangement between parties to share the overall responsibility for implementing tasks and to be jointly accountable to stakeholders. We know that our long-term success depends on creating value with our local Partners and for our shareholders. From the day we commence exploration, we begin to formulate a specific management plan to develop, operate and close mines in a manner that improves the lives of the people in the surrounding communities, in a safe and environmentally responsible manner. By maintaining high standards for protecting human health and the environment, and working in cooperation with our local Partners, we endeavour to create sustainable, long-term economic and social benefit. Specifically on Artisinal mining, Gulf has utilised several approaches in implementing its Partnership Policy. In producing the Report Gulf analyses the specific needs of the Artisinal mining community and may seek to provide alternatives including off-take arrangements with Artisinal Mining Associations, Community Trusts, recruitment as part of Gulf’s employee base, employment in environmental rehabilitation and creating alternative sources of employment.